After his graduation from Cathedral Latin School in Cleveland, Ohio, Jones spent his college years at Michigan State University. 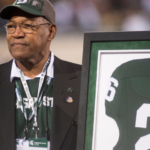 He finished sixth in voting for the 1966 Heisman Award, the Michigan State Spartans second year in a row as national champions. 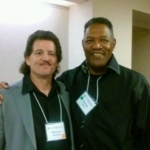 Clinton Jones is a former professional American football player in the United States from 1967 until 1973. After his graduation from Cathedral Latin School in Cleveland, Ohio, Jones spent his college years at Michigan State University. 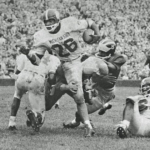 He finished sixth in voting for the 1966 Heisman Award, the Michigan State Spartans second year in a row as national champions. 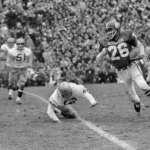 Jones was drafted by the Minnesota Vikings in the 1967 NFL Draft. The pick used to draft Jones was one received by the Vikings from the New York Giants in exchange for the quarterback Fran Tarkenton. 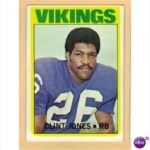 Jones spent six seasons, 1967 to 1972, with Minnesota before moving on to the San Diego Chargers for one last season in 1973. Clint Jones is a member of The Pigskin Club Of Washington, D.C. and National Intercollegiate All-American Football Players Honor Roll. 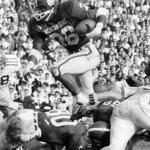 On January 9, 2015 Jones was named to the College Football Hall Of Fame. Master Marquez and Clinton Jones at GM Kam Yuen b day event.